Here are some wonderful testimonials from previous newlyweds at The Outbuildings. ❝We fell in love with the Outbuildings; it was our first and only wedding venue viewing. We got married at the Outbuildings, Llangaffo. The venue and rooms were fabulous, with stunning views in a great location. The staff were very friendly, efficient and couldn’t do enough to ensure a perfect day, with first class food from the inclusive breakfast to the wedding meal. ❝ The Outbuildings was the perfect setting for our relaxed intimate wedding. The venue was gorgeous. Cosy inside and stunning views the entire way around which ensured plenty of beautiful photos. The staff were all so friendly but one of the best things about having our wedding here was the wedding co-coordinator which comes with the venue, it would have been incredibly stressful without one in retrospect. Millie, the co-coordinator worked with us to make sure the day ran smoothly and perfectly, which it did. Me and my new husband stayed in the pink hut which was very cute and surprisingly spacious. Our family stayed in the other four rooms in the main building and all said how beautiful and clean the rooms were. ❝We got married at The Outbuildings at the end of May, and are absolutely thrilled we chose it as our wedding venue! Having stayed there for a few long weekends over the last few years, we didn’t look at any other venues, we knew straight away where we wanted it to be. We had such an amazing time, we really couldn’t have asked for more. The Outbuildings team worked so hard in sorting everything for us, and for keeping everything ticking along on schedule over the weekend. All the staff involved were fabulous – we’ve had so many comments about how friendly and helpful everyone was, it really helped create just the atmosphere we wanted. Everyone had a really super time – it was nothing less than perfect! ❝At the end of July my husband and I were lucky enough to have The Outbuildings as our wedding venue. We didn’t look at any other venues as The Outbuildings ticked all the boxes for us. The location and setting is picturesque. The staff are warm and welcoming. The rooms are very comfortable and the facilities are very clean. Everything at The Outbuildings is beautifully presented and we were thrilled that our guests loved our venue as much as we did. From the first meeting we had with Millie and Judith we knew that our wedding was in very capable hands. Millie was a great help during the months of planning and was great to work with. Millie was extremely helpful throughout the process from recommending our caterers to decorating the marquee the night before! She was a constant support and worked extremely hard, thank you! ❝As it’s 4 weeks tomorrow since we were married at The Outbuildings, I thought I should drop you a note. Both Jon and I, and our guests would dearly like to thank you and your team for allowing us to have our wedding with you to begin with, but for the smooth running and organisation with absolutely everything. Although it was a relatively small gathering, it requires a great deal of effort and professionalism, which you readily provided for us before and during. The food was amazing, so please do pass on our gratitude to your wonderful chefs, and especially because of the delay we caused with our little jaunt out to Newborough for the photos, we can‘t thank them enough. It was sublime! (Food and Newborough). 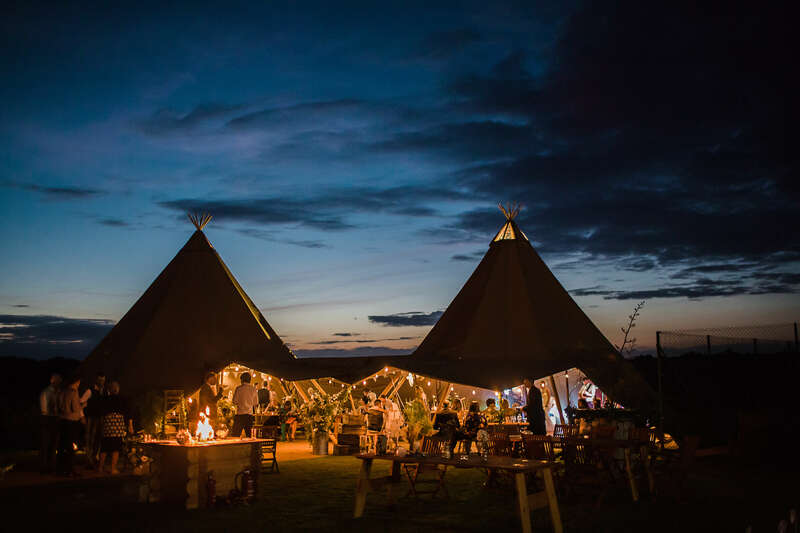 You have a spectacular venue in a beautiful part of North Wales, and when you make the effort and order glorious sunshine for your guests too, what a bonus that is. Especially when you’re hit with Storm Ophelia the day before, that was a close call. ❝ A beautiful setting for our daughter and son-in-law’s wedding.